In a medium, microwave-safe bowl, combine butter and peanut butter. Heat in the microwave until soft; mix well. Gradually stir in confectioners' sugar until the mixture resembles a soft dough. Spread mixture into 2 pie crusts. In a small bowl, mix the milk with the instant pudding. Pour over the peanut butter mixture in each crust. Chill until firm. Top pies with whipped topping when ready to serve. This pie was ok, but the different textures just didn't seem to work well with each other. I made it exactly as written. Delicious recipe. We made 2 changes. First we only used 2 cups confectioners sugar, and second we used 1 1/2 cups of milk. It turned out great! I added a layer of thinly sliced banana between the peanut butter and chocolate pudding and sprinkled the top with chocolate chips...very very yummy! This was a great pie. I followed the guidance of reducing the sugar to 2c and the milk to 1.5. I think next time I'll make the same amt of filling, but put it in one deep dish pie. AWESOME! I loved this! It was so easy and delicious. 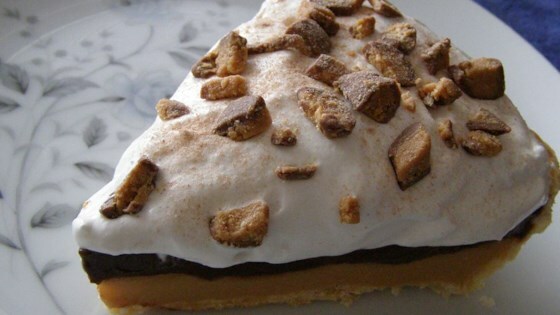 Peanutbutter is very rich w/chocolate crust and chocolate pudding, it is balanced out and wonderful. Thanks for the recipe!